I love crochet style books with lots of stitch patterns to help me design projects. 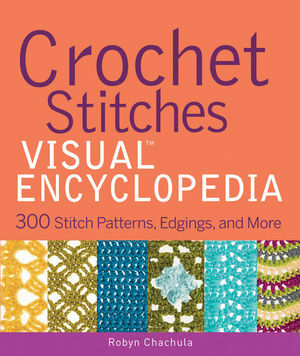 Crochet Stitches Visual™ Encyclopedia by Robyn Chachula is an excellent addition to a crocheter's library. Each of the patterns is laid out in both International crochet diagram symbols and written patterns in American terminology with a very clear color photo that shows the finished item with great stitch definition. So if you're more comfortable with written patterns, but want to learn how to follow crochet diagrams, or if you're very comfortable in diagrams but would like to learn how to follow written patterns, following one while noting the corresponding row or round in the other version of the pattern will help you learn. There is a logical progression to the book that makes it very clear and easy to find the stitch type you need for your idea. Chapter 1 is the simplest stitch patterns, based around one stitch +chain stitch, with variations like front and back loop. Each technique new technique is explained. A few types of foundation rows are also shown as an alternative to a straight chain foundation. These are staple stitch patterns which would work well in a lot of projects. The chapter ends with a few patterns that use a couple stitch types, in easy repeats. Chapter 2 is textured patterns. There is so much texture available for crocheters! This chapter uses stitch combinations and stitches worked around the posts of the previous row for lots of texture and interest. These are the stitches for dishcloths, sweater vests and other things you want to have texture. This is also the chapter that will really help improve your crochet skills if you're looking for more advanced techniques. Patterns like the Popping Circle stitch which creates circles in double crochet that come of the flat surface of double crochet fabric are a fun challenge to learn. Chapter 3 is basic lace patterns. The light, airy crocheted lace that's so perfect for stoles, shawls, fashion scarves. This has shells, clusters, lattices, waves and pineapples. Chapter 4 is more advanced lace patterns using knot stitches, short rows and filet crochet. It also has beautiful partial motif patterns which are a great option for a lot of applications. I like them for summer fashion scarves. Chapter 5 covers colorwork. While most stitch patterns can be worked in different colors, this chapter specifically covers stitch patterns that work best using different colors. These are great effects for any crocheter to have in her repertoire. The diagrams are shown in different colors to show where you change color. It also has surface treatments like slip stitch over a colored background. Chapter 6 is Tunisian stitch patterns, which show the amount of variation possible in Tunisian stitch, including laces and cables. 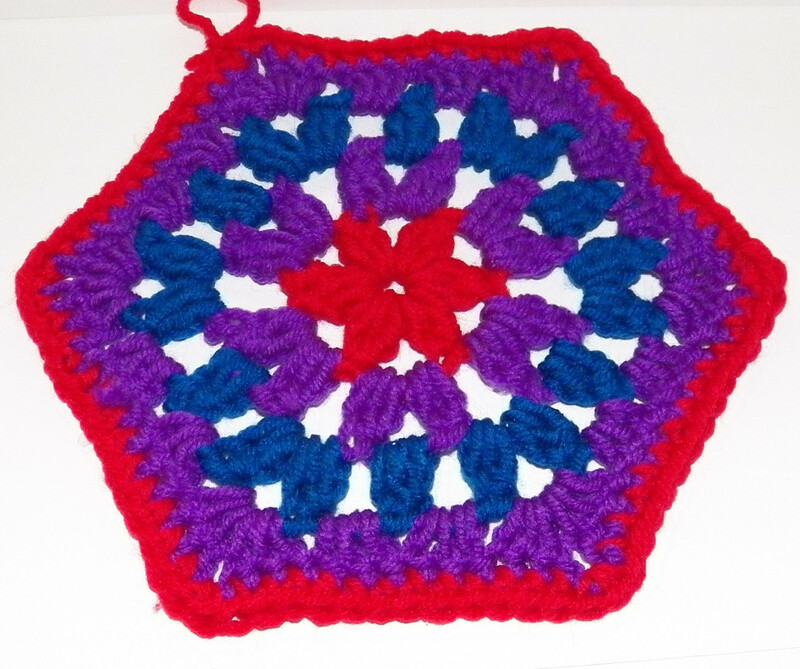 Chapter 7 is square and hexagonal granny square style motifs. These are the foundation of so many great projects like afghans, potholders and fashion crochet. The motifs are worked in the round and use bobbles, colors, and chain spaces to create visually interesting motifs that easily tessellate for projects. Crocheted using acrylic yarn switching colors every round. If you have a pattern for a vest or other motif project that you'd like to customize, this chapter has some good options, including some fantastic lacy, intricate designs which work up fast. Chapter 8 is flower and snowflake patterns and information on joining motifs using methods like slip stitch, single crochet and a very visually interesting V stitch seam. The motifs are small, they would be great for joining as motifs, but also just by themselves as decorations or tawashi (Japanese scrubbing brush or dishcloth). The last chapter is edgings, which are so important in so many projects. A basic granny square or simple mesh shawl becomes a lot fancier with the right edging, and edgings can be used to dress up all sorts of things. The edgings range from the very solid Spike Cluster Edging which works well for non-frilly projects to the lavish lace effect of the Mystic Edging. It's a great collection for crochet designers and people who want to learn a lot more stitches. It's not a book for a beginner. There is a glossary of terms and a table of stitches at the end of the book to help follow the diagrams. It's absolutely a book that I can recommend. One of my favorite tv watching projects is sampler style bottle cozies for summer hikes. I use cotton yarns and just stitch stitch patterns every time I get bored with what I'm doing. It's a good way to practice new stitches, and this book will be beside me as I work on them. Thanks for the good review. I always like to hear your honest opinion, since my crochet skills are about like that of a preschooler. I'm off to check out that shu shu idea! Thank you! Thank you so much for the kind comments and continued support, it means the world to me. Shu-shu is just such a fun word!